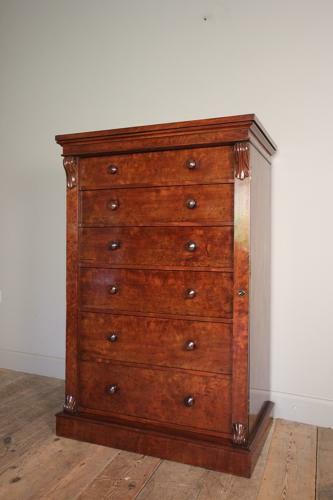 A large country house Wellington Chest of Drawers, having an arrangement of 6 graduated drawers, all retaining the original turned knob handles. The drawers flanked by 2 locking bars with acanthus leaf decoration to both top and bottom. Retaining the original Chubb lock and key. Fully Cedar lined with super grain, colour and condition throughout. English, Circa 1840.